Created by K. Hansotia, Gurkha cigars are for the true and aspiring Cigar Aficionado. 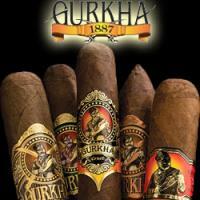 Gurkha Cigars feature fine tobaccos from Nicaragua, Indonesia, the Dominican Republic, and Honduras in its fillers. Gurkha Ancient Cigars are one of the most popular cigars to buy online. True to its name, the legendary smooth taste is also a medium bodied blend for fans alike. The Gurkha G3 is among the strongest offerings, comprising of no less than 3 Nicaraguan Ligero Leaves, produces an easy draw with plenty of white, toasty, smoke. The Gurkha G5 is a Nicaraguan Puros that delivers a rich, full taste that is dressed to impress in oil wrappers. It features a well-balanced smoke and a gentle smack of pepper and cedar. The Gurkha Grand Reserve is a box-pressed blend that has been rated 90 by Cigar Aficionado. Aged for five years, these cigars are made in limited edition and are extremely rare to find. Lastly, the Gurkha Vintage Shaggy is the epitome of a luxury cigar, coming from the old-world Cuban tradition. The question isn't whether you should pick up a box of Gurkha cigars, the question is which one; the choice is yours, choose wisely.